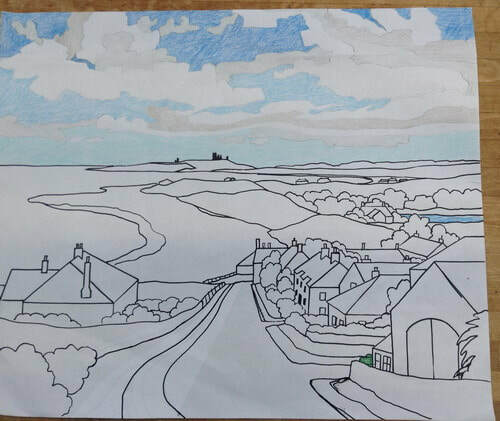 The story behind "Low Newton II"
This one of my favourite views in Northumberland, looking down the hill above the village of Low Newton across the beaches of Newton Haven and Embleton Bay to the ruined Dunstanburgh Castle. In Northumberland the sky always seems massive and I wanted the sky to be a real feature in this picture. 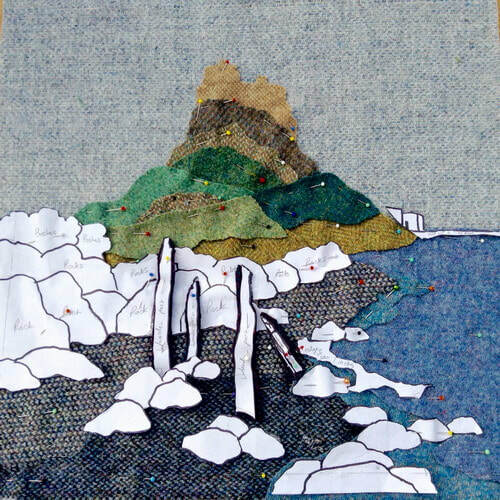 I used three different shades of blue Harris Tweed for the sky to represent the way the colour of the sky deepens from the horizon upwards. ​The building on the right of the picture is known as the Rocket House, now a holiday home, but previously used by the coastguard used to store his boat and rockets. In the middle distance on the right of the picture you can see Newton Pool, a freshwater lake, now a nature reserve for wild birds. 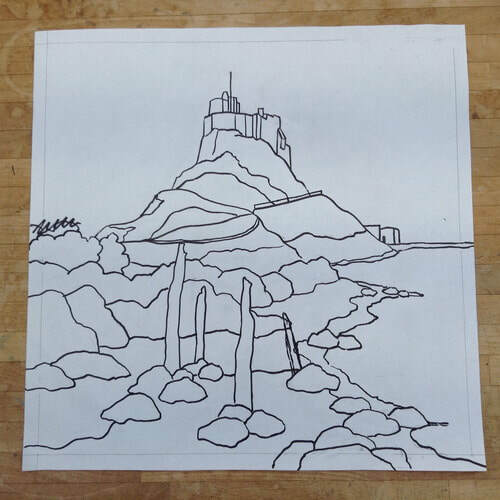 My line drawing for Dunstanburgh Castle III Being "helped" by Marilyn to needle felt. 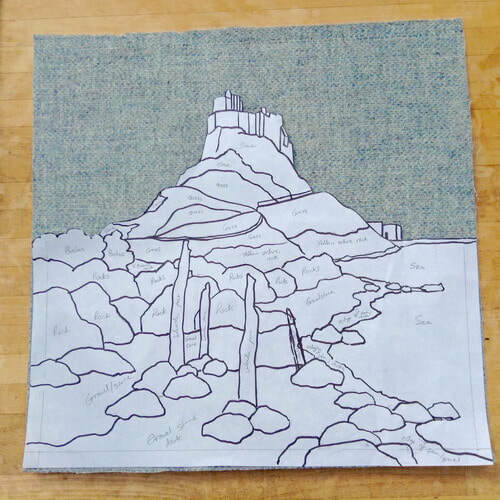 The line drawing above was cut up and used as you would a dressmaker's paper pattern to cut out all the pieces of Harris Tweed for the picture. 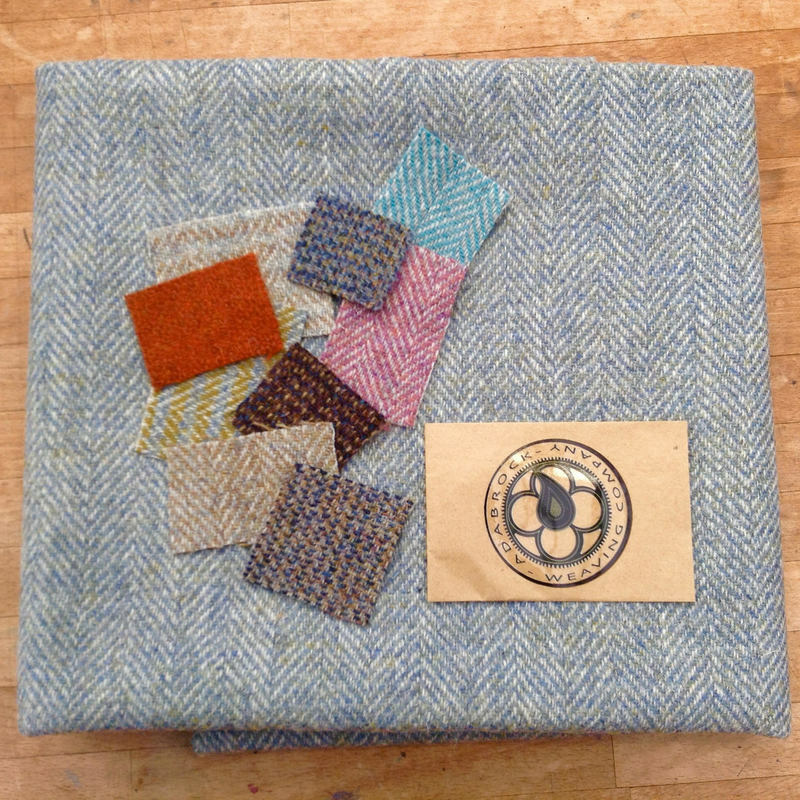 These pieces of tweed are then pinned and needle felted onto the background piece of Harris Tweed (the darker blue tweed in the above right hand photo.) All the details are then needle felted into place using wool yarns. As you can see on in the photo on the right, I have quite a lot of blue wool yarns in my stash! "Low Newton II" has now sold but the image is still available as a greetings card or a giclee print in 2 sizes (£25 & £75) from the Bakehouse Gallery or our online shop. 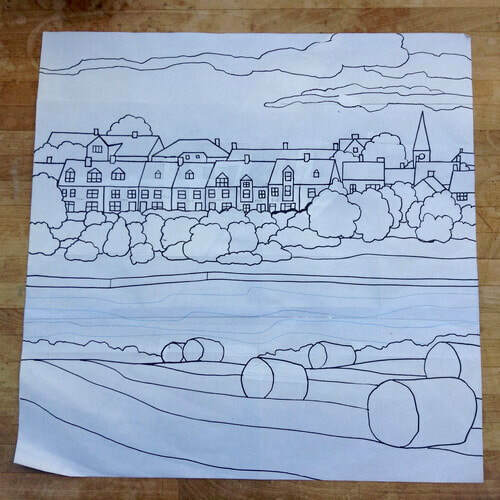 The story behind "Alnmouth II"
This is a really well known view of the lovely coloured houses of Lovaine Terrace in the seaside village of Alnmouth, Northumberland, as seen from across the river Aln. 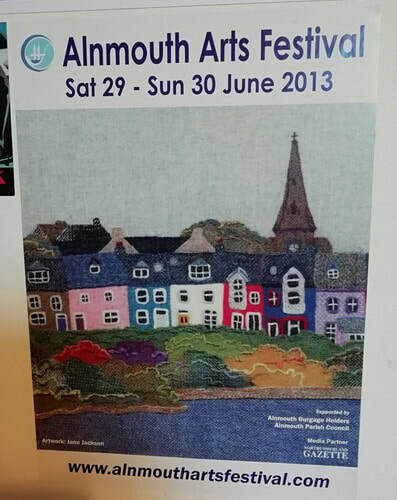 My first version of this scene won the Alnmouth Arts Festival poster competition in 2013. Winning this competition was quite a milestone for me as it gave me the confidence to become a full-time professional artist. 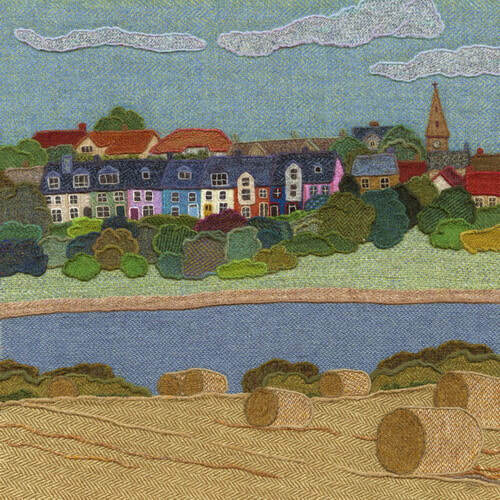 But I have never been entirely happy with the first version as it didn't include all of the houses and this is why I did a second version. 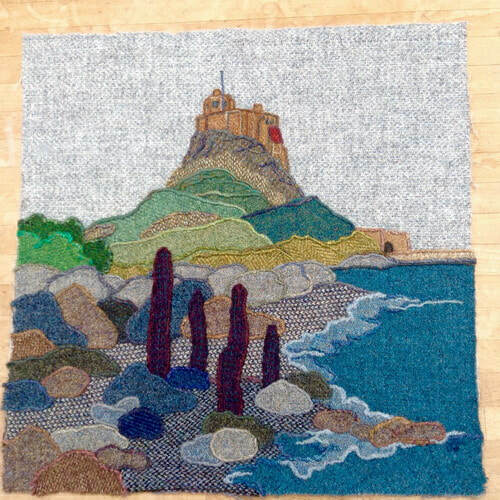 However, the technique I use to create my pictures, needle felting a Harris Tweed collage with the details added in needle felted wool yarns, means that there are limitations as to how small a very detailed picture can be. 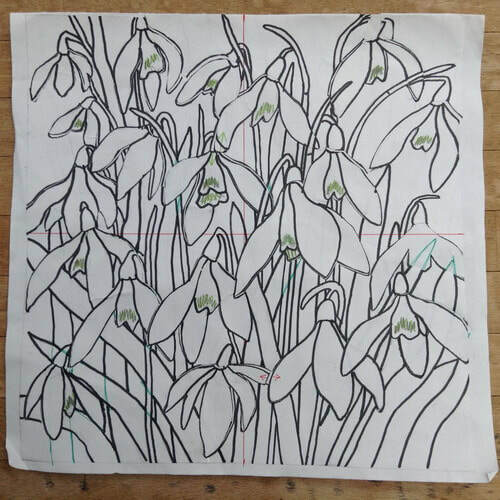 So as a result the picture had to be pretty large (19.5" square unframed) in order to fit in all the houses. I'd like to think my needle felting has improved over the years and I think that the houses in the latest version are definitely a bit neater. 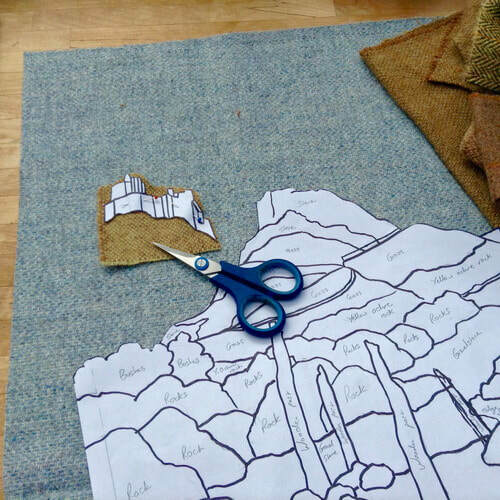 All my pictures start with a line drawing, which I cut up and use as you would a dressmaker's paper pattern to cut out all the pieces of Harris Tweed for the picture. 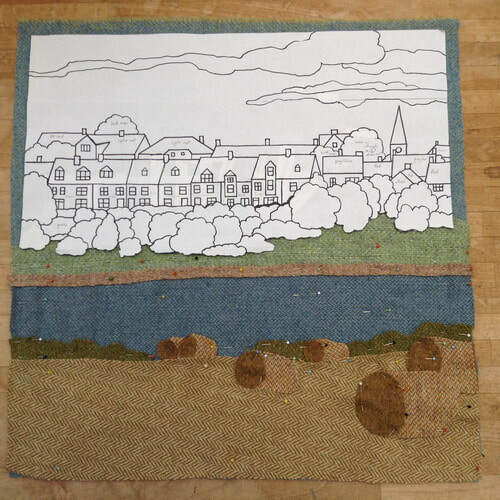 Gradually building up the collage onto a large background piece of Harris Tweed the size of the entire picture. 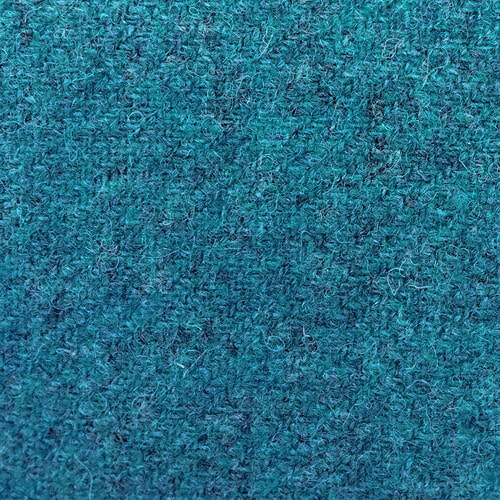 Here the background tweed is the light blue herringbone tweed I've used for the sky. 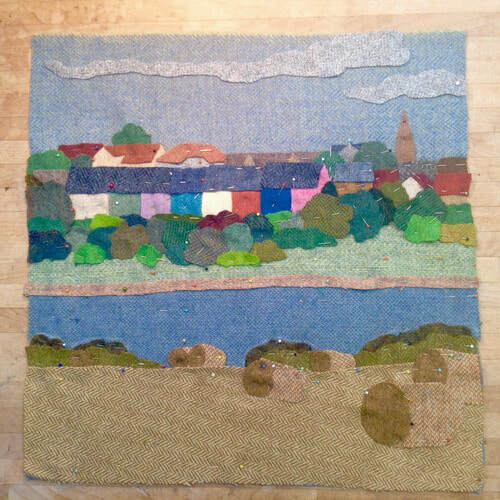 All the pieces of Harris Tweed are pinned and ready to be needle felted into place. 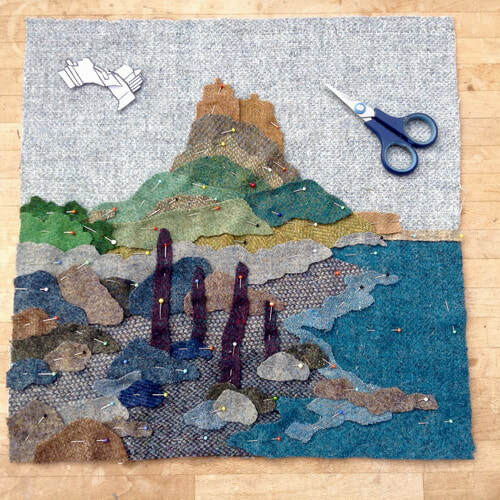 Once they are needle felted into place I then needle felt all the details onto the picture using wool yarns. Each picture takes between 35 and 45 hours to make depending on size and the level of complexity and detail involved. 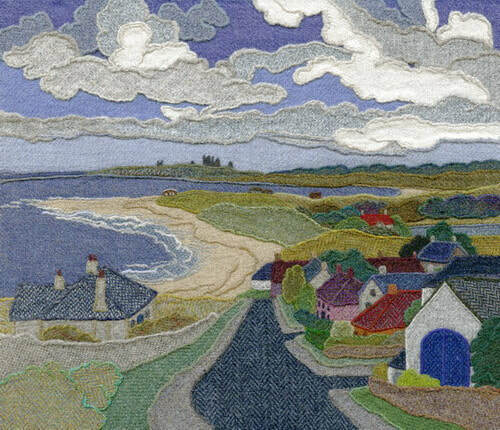 "Alnmouth II" has been professionally framed in a plain wooden frame with an opaque white finish. It measures 21.25 inches square (inc. frame) and costs £750. 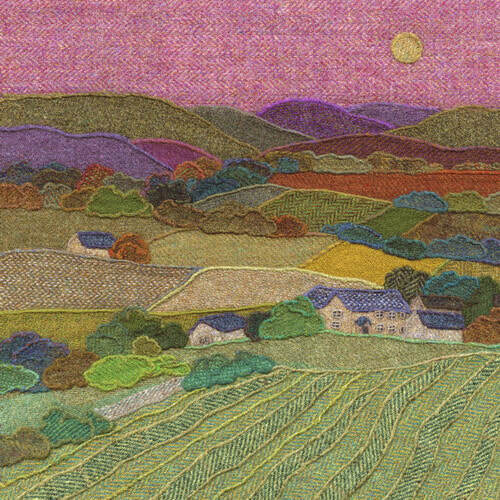 It is also available as a greetings card or a giclee print in 2 sizes (£25 & £75) from the Bakehouse Gallery or our online shop. Northumberland is a very special place for terns. Every year in May, June & July the beach by Long Nanny (a quaintly named stream near Beadnell) becomes the largest nesting ground for Arctic Terns in the UK. Arctic Terns migrate here all the way from the Antarctic, a journey of at least 12,000 miles. The much rarer Little Tern and Roseate Tern also come to Northumberland to breed in the summer. Terns are smaller than Herring Gulls and these agile little birds can be seen flying up and down the coastline of Northumberland,scanning for fish below, and when they see one, they dive into the sea in a most spectacular manner. In this picture I have tried to capture this behaviour on a clear summer's morning and you can take it from me that there is a calm and sparkling blue sea down below. There are a few special Harris Tweeds used in this picture. Firstly a very, very rare white Harris Tweed, which I am so lucky to have. I bought this white tweed quite a few years ago and as far as I'm aware it was specially made for a wedding dress (shown right) for a Harris Tweed fashion show back in 2011. The show was staged to celebrate the centenary year of the ‘orb’ trademark and showcased cutting edge designed pieces from some of Scotland and the UK’s most talented and celebrated designers including Vivienne Westwood. ​I use this white tweed a lot and I don't know what I'd do without it! 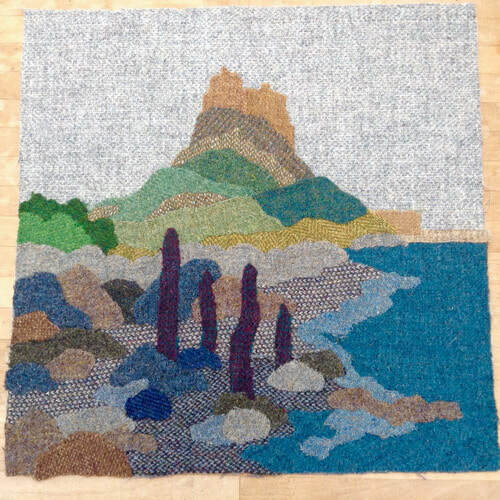 Secondly, most of the clouds are made out of a gorgeous and herringbone Harris Tweed woven by Margaret Rowantree of the Adabrock Weaving Company. I ordered some of this tweed from Margaret and not only did she send me some lovely and very tempting samples, but she also sent me some scraps of the same tweed that I'd ordered but the herringbone pattern in varying different widths. These scraps were what I ended up using for most of the clouds. I think that the different widths of herringbone just add a little bit more interest and texture. 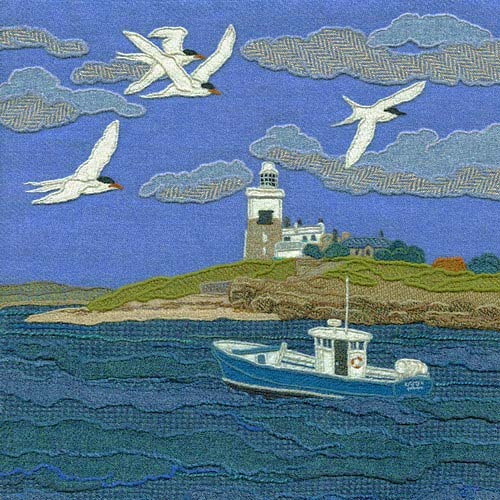 "Flying Terns" has now sold, but there is a new slightly different version for sale in the exhibition. 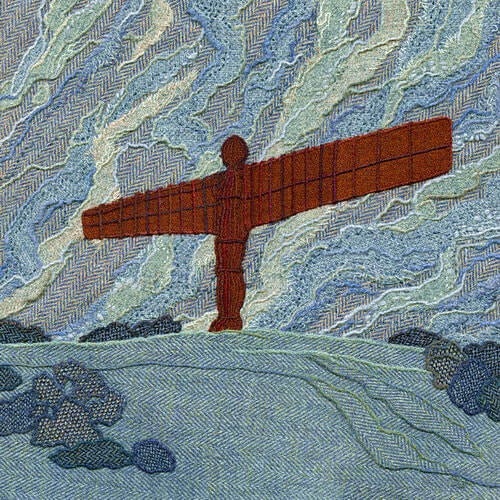 But this image is still available as a greetings card or a giclee print in 2 sizes (£25 & £75) from the Bakehouse Gallery or our online shop. 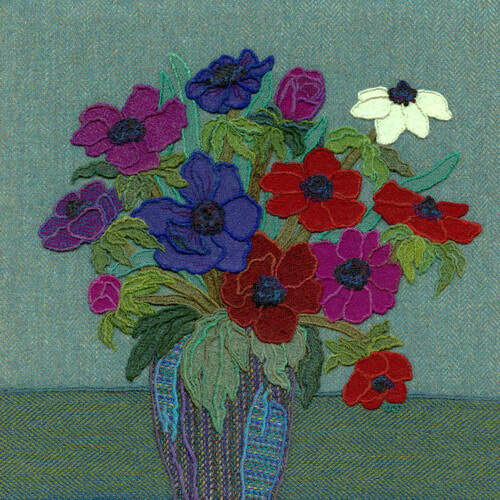 This is "Anemones", created primarily because they are my Mam's favourite flower and also one of my favourites too. I love the velvet-like texture and really intense colour of the petals, especially the blue flowers. 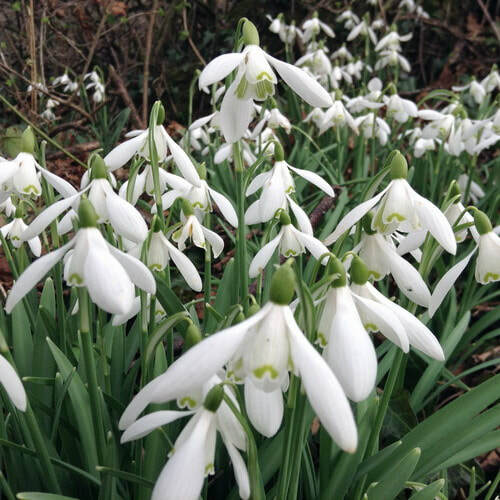 You don't get many flowers that are such a true blue. The inky purple, black stamens provide a great contrast with the bright colour of the petals too. 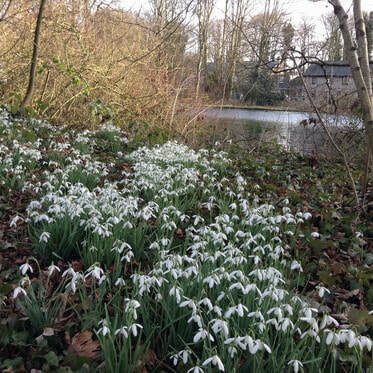 They are also a spring flower and spring is my favourite time of year. 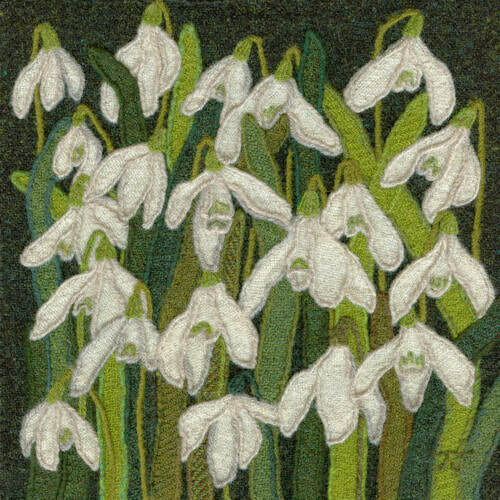 The starting point for this picture was the background Harris Tweed as I knew it would provide a really good contrast with the flower colours. 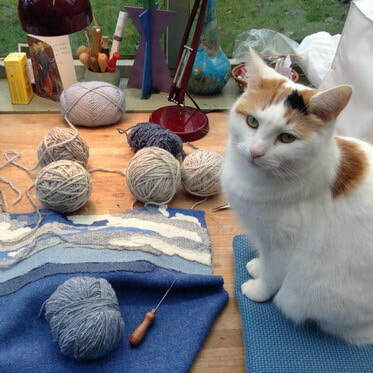 ​The background tweed is an amazing turquoise blue herringbone woven by Heather Macleod of Handmade by Heather. 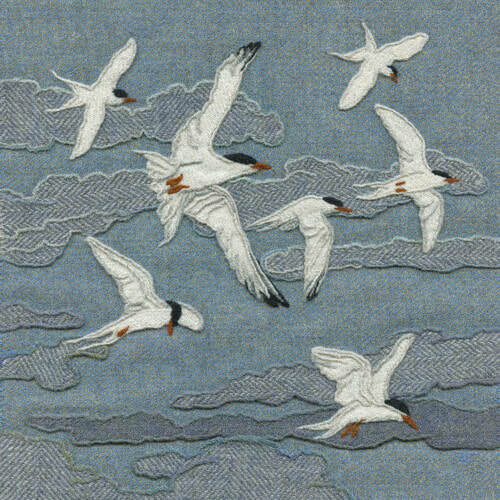 Heather is one of a growing number of female weavers of Harris Tweed, a fabric traditionally woven by men. I think it's fantastic that women are weaving now. They also seem to be quite a creative lot who like experimenting with new patterns and produce some very interesting and unusual Harris Tweeds. Heather is one of several weavers I follow who post about their latest Harris Tweeds on facebook. I think this is really great as it makes it so easy to pick up new exciting tweeds for my work. But you do have to be on the ball as they can sell out really quickly. Sometimes a tweed can sell out before it's even woven, just based on a photo of the yarns they'll be using! "Anemones" has been professionally framed in a plain wooden frame with an opaque white finish. It measures 19.5 inches square (inc. frame) and costs £625. 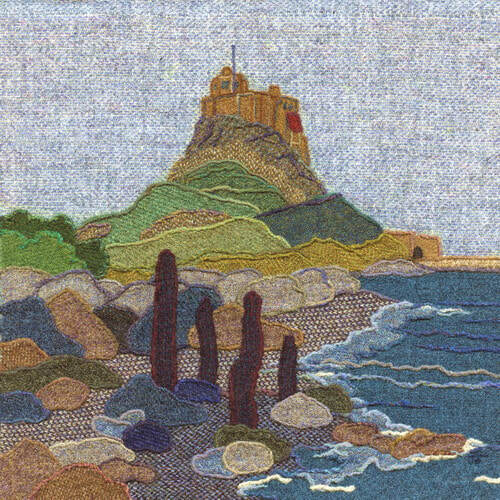 It is also available as a greetings card or a giclee print in 2 sizes (£25 & £75) from the Bakehouse Gallery or our online shop. 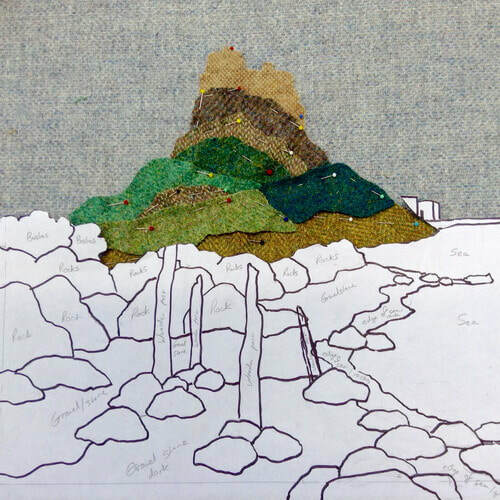 The story behind "Winter Fields"
​I'm doing a series of blogs with a little bit of background information about some of the Harris Tweed "paintings" in my exhibition. 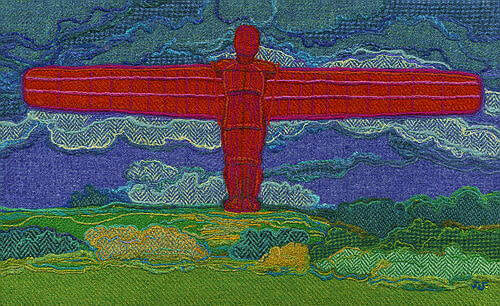 at the Bakehouse Gallery in Alnwick this summer. 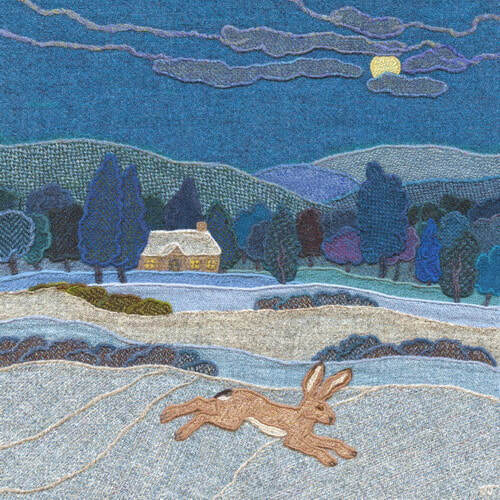 "Winter Fields is an imaginary winter landscape with a hare running across the snow under a full moon. There are lots of legends from around the world linking hares to the full moon. For example the Celts believed that the goddess Eostre changed into a hare at the full moon. This picture is all about blue and blue is my favourite colour, especially teal. Therefore I do love doing winter scenes and pictures that involve sea and sky. The background Harris Tweed in this picture is one of my all time favourites. But sadly I didn't buy very much and I've only got enough left to do a couple more pictures. Harris Tweed is quite hard to photograph as the yarn its made from is usually blended from several colours. This is a close up of the background tweed I used in "Winter Fields". It is a dark teal made from a yarn that has a small amount of black blended into it. 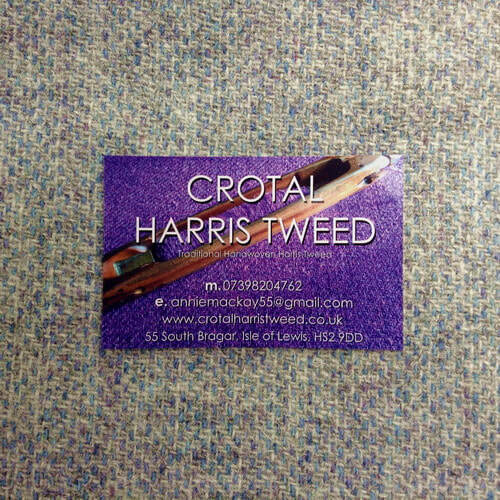 I have been in contact with the weaver who wove this particular Harris Tweed and asked if they will be making anymore. But sadly they say they haven't seen the yarn again since. I have a lot of blue tweeds and I really enjoyed using a mix of patterns and colours to make up the trees in this particular picture. Shown in close-up detail in the photo on the right. "Winter Fields" has been professionally framed in a plain wooden frame with an opaque white finish. It measures 18 inches square (inc. frame) and costs £600. 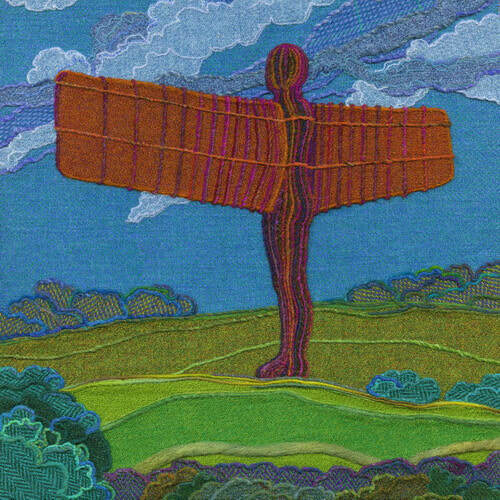 It is also available as a greetings card or a giclee print in 2 sizes (£25 & £75) from the Bakehouse Gallery or our online shop.